This mini-park is under renovation with short and long-term projects. Short-term funding has been secured and long-term funding is still under negotiation. The park is being designed by Miller Company Landscape Architects. Go to http://www.fallenbridge.org if you're interested in participating in beautifying this mini park! Hold park work parties every 2-3 months. Water the park as needed. Pick up litter as needed. Remove graffiti when it appears. Add new plants to replace ones that have died. Utah and 18th Mini Park is owned by the San Francisco Recreation and Park Department. 9-San Bruno and 33-Stanyan -- Potrero and 18th St. stop; walk one block east on 18th towards the freeway (it's an uphill walk), then turn left on Utah. Neighborhood oral history tells us that in the 1930s the state condemned property that was to be used for the 101 freeway. Because of World War II, the freeway could not be built and residents were allowed to rent their houses for $25 a month. Somewhere in the 1950s the freeway was finally built. A number of walking bridges were built so that folks could cross the freeway on foot. One such bridge connected 18th street from Utah Street on the west to San Bruno Street on the east. The transformation of the freeway easement into a mini-park occurred as a result of the collapse of the first walking bridge. When the walking bridge was reconstructed, it provided an opportunity for the Potrero Boosters neighborhood association to work with the city and Caltrans to create a mini-park, called 'Fallen Bridge Park' at the Utah Street entrance to the walking bridge and a smaller park, called 'The Benches' on the San Bruno Avenue side. The Fallen Bridge Park contained a children's playground sand area with a metal slide and a number of metal horses for sitting and bouncing. The sand area was encircled by the exit from the walking bridge. The front of the sand area contained three benches. To the north of the sand area was a hilly area bounded by 3 ft high wooden retaining walls at the sidewalk level and a house at the north end. The hilly area contained benches, trees, grass and landscaping. 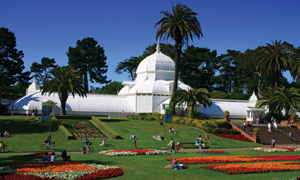 This park area was maintained by the San Francisco Department of Recreation and Parks. To the right of the sand area, there was more reclaimed land which was maintained by the State of California. Since 1972, there has been no significant upkeep of the park. Rather than do a park upgrade, as things decayed, they were removed. The slide and bouncing horses were taken out of the sand area, making it a target for broken bottles and graffiti. The wooden benches were removed from the front of the sand area. The wooden retaining walls continue to decay. The park frequenters included hookers and party goers looking for an outdoor urinal. Neighborhood efforts to fix the park were restricted to painting over graffiti. In March 2004 the neighborhood formed a committee of the MUNA neighborhood association to address the park problems. The committee met with RPD and discussed a embarking on short term plan and a long term plan. The short term plan included cleaning out the hilly area of the park and laying down mulch to discourage weeds as well as planting flowers in the sand area after laying weed cloth and covering the weed cloth with mulch. Much of the short term plan has been accomplished with neighborhood participation.